IF YOU'RE looking for a country experience with all the city comforts, Deshons Retreat Kingaroy is for you. Jayne and Frank Deshon offer the finest of foods and comforts from their two private self-contained retreats situated on the Great Bunya Drive just 9km from Kingaroy or two-and-a-half hours from Brisbane, the Sunshine Coast and the Gold Coast. Described as a modern version of the iconic Australian "tin shed", the bungalows recently have been revamped in keeping with the owners' high standard of quality in everything from king- size beds, sumptuous towels and linen, luxurious soaps and lotions through to a superb offering of locally-sourced produce. Reminiscent of a boutique hotel, Jayne and Frank will have you feeling as though you're a treasured friend staying for a visit, without the company. Waking to the silence of solitude and country air you'll welcome the breakfast basket made up of local and home-made products including homemade baked beans, the recipe which Jayne has kindly shared. Other offerings include local bacon and sausages, fresh-laid eggs, plunger coffee, loaves of home baked bread and local peanut butter. Cheese platters as well as dinner packs are also available. To ensure the family dog also gets a holiday, Jayne and Frank welcome dogs by prior arrangement. 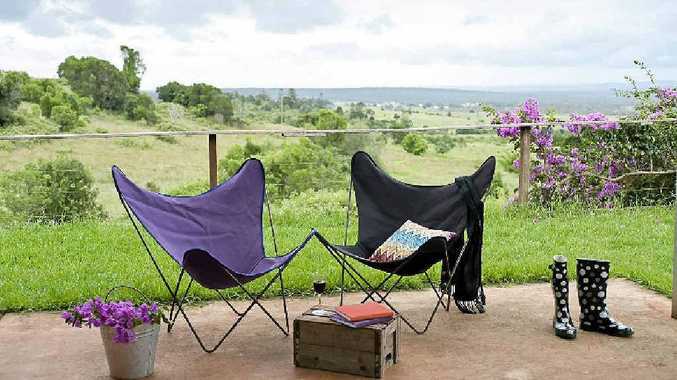 If accommodation of a more rustic note is to your liking, Hillview Cottages offers three stylish but distinctly different accommodation choices. All have been comfortably renovated. Choose from The Dairy, The Worker's Cottage or The Church. Depending on whether you're enjoying a romantic interlude or time with friends and family, you'll find the perfect getaway with Steve and Cathy Davis. Located on the edge of Kingaroy, this unique award winning Booie range retreat has many of the comforts you'd hope for, such as double spa baths, wood fires and air-conditioning. Take in the stunning rural scenery without the hard work. Relax, unwind and breathe deeply. You'll be pleased you did. For more information on the South Burnett, go to queenslandholidays.com.au.